Hatters keeper Craig King felt West Brom attacker Callum McManaman made it easy for him to save from the penalty spot during Tuesday’s EFL Checkatrade Trophy triumph. With the scores goalless, King, making only his second start for the club, guess right to turn aside McManaman’s tame effort from 12 yards on 16 minutes and speaking to the press afterwards, said: “It was terrific, he might as well have told me where he was putting it as it was a bit obvious. It was a very quiet evening, not what I was expecting at all. I did what I had to do and it was a perfect day for me. “As a goalkeeper you know where he’s going to put it, it wasn’t a great penalty and I think a lot of keepers would have saved it. “It was a perfect start to the game and then to go on and get a clean sheet and win the game comfortably in the end, outplaying an Under-23 Prem side is just unreal. The fact that King was tested from the spot was baffling in itself, with centre half Frankie Musonda executing a wonderful sliding challenge on Rekeem Harper, only for referee Andy Davies to award a penalty. 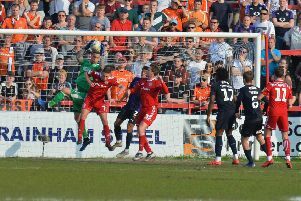 Boss Nathan Jones said: “I think he’s the only one on the planet who thought that was a penalty. Striker Zane Banton was of a similar opinion too saying: “No-one put a foot wrong I’d say, the whole night. King wasn’t overly tested for the rest of the evening, bar Jonas Olsson’s header clipping the bar and another McManaman effort in the second period that flew inches wide as Town eased to a 2-0 win thanks to goals from Alex Gilliead and Jake Gray. He added: “It was a very quiet evening, not what I was expecting at all. I did what I had to do and it was a perfect day for me, really. It’s all good and I’m just happy.